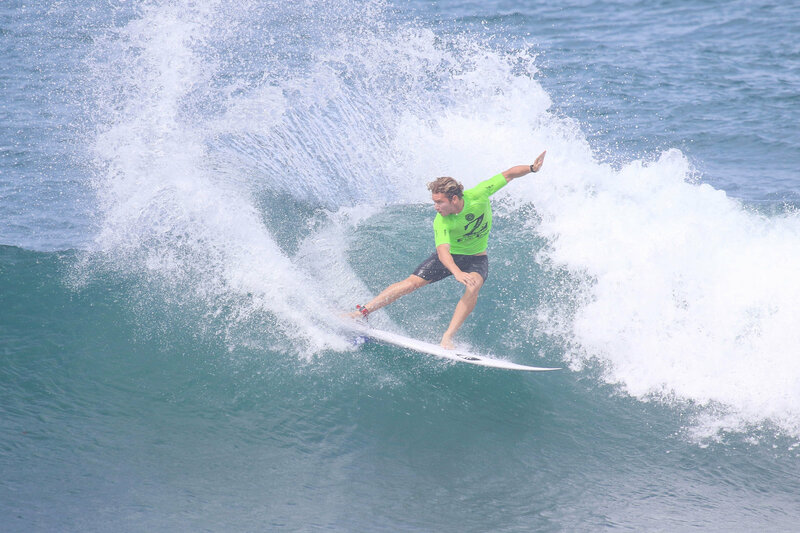 SOUP BOWL, Bathsheba, Barbados (Wednesday, November 7, 2018) – Spectators and competitors were treated to more beautiful Soup Bowl conditions at the World Surf League (WSL) Men and Women’s Live Like Zander Junior Pro in Memory of Zander Venezia for their opening affairs. Three-to-four foot, occasional plus sets streamed into the world-class reefbreak with competition pushing through Round 1 and 2 of the men’s, as well as Round 1 and Quarterfinals of the women. The Thomo QS 1,000 In Memory of Bill Thomson was called off for the day. World Junior Championship spots are on the line for both men and women, and rare mistakes were made from those in contention to continue their hunt. The women got their first taste of Soup Bowl this year following men’s Round 2 as Samantha Sibley (USA) took care of the task at hand brilliantly and secured her place into the World Junior Championship with a Quarterfinal win. Sibley built her foundation throughout the heat before taking a victory lap in the final seconds and earning a near-perfect 9.50 (out of a possible 10) to earn a 16.00 (out of a possible 20) heat total. Thirteen-year-old Ava McGowan (USA) took the event by storm, topping recent ISA Gold Medalist Rachel Presti (DEU), and eliminating one of 2018’s top threats Kayla Coscino (USA) with a 12.27 heat total. The New Smyrna Beach, Florida, native matches her best result so far after earning a Semifinal result in Cocoa Beach earlier this year, her only other WSL contest she’s attended. Caption: Guadalupe’s Thomas Diberre (FRA) laid waste to the pristine conditions once more, this time in the Pro Junor. Before the women made their debuts, men’s Round 1 witnessed fireworks in Heat 2 with Guadalupe’s Thomas Diberre (FRA) posting a 16.67 heat total and carried that momentum into an advancing spot behind Crosby Colapinto (USA) in Round 2. The European competitor revels in the opportunity to contest near home, particularly with prime Soup Bowl on offer and frequents the island on a regular basis. But it was Taro Watanabe (USA) who unleashed the men’s highest single-wave score of the day with a near-perfect 9.50 under priority to secure a Round 2 win. Watanabe has the opportunity to capitalize if one of the Top 6 competitors falters, but understands it’s a heavy order. The race for the Top 4 began in Round 2 as No. 2 Colapinto, No. 3 Kade Matson (USA), No. 4 Bo Raynor (USA), No. 5 Eithan Osborne (USA) and No. 6 Cole Houshmand (USA) all made their debuts count. Both Raynor and Osborne survived with clutch performances in the final minutes of their respective heats as Colapinto, Houshmand and Matson decimated their Pro Junior debuts. Osborne’s success away from the Pro Junior season unknowingly set him up in a great position as he’s only adding points after getting to experience the Stab High, winning highest air, and participating in the Redbull Airborne France. Only Chase Modelski (USA) fell short of an advancing place as an outside contender with Tommy Coleman (USA) and Alan Cleland (MEX) still in the running. But, an all-important Quarterfinal draw awaits with contenders still in the mix unless they secure a spot into the Semifinals. A 7:30 a.m. call will determine an 8:00 a.m. start for Quarterfinal Heat 4 of the women’s Live Like Zander Junior Pro and Round 2 of the Thomo QS 1,000.